The entire Shekhawati region is well known for its painted havelis (mansions with frescoes). Mandawa in particular is central to this particular form of art. The Havelis were built in this grand style by the prosperous merchants of those times. Now the entire town is referred to as an Open Art Gallery. The 'Mandawa Haveli' is a prime example of the art form unique to this region. It was made by a Marwari jeweller in 1890. Now more than 125 years old, it is well maintained. 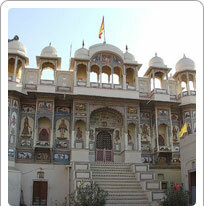 The Mandawa Haveli is situated near the Sonthaliya gate and is the first haveli on the way to the old town. Its splendid architecture and beautiful frescoes of Lord Krishna the cowherd charm everyone. Each room is named after the various names of Lord Krishna and has paintings to match. Now a charming hotel, the warm and gracious hospitality of the people here will add to fond memories of Rajasthan.